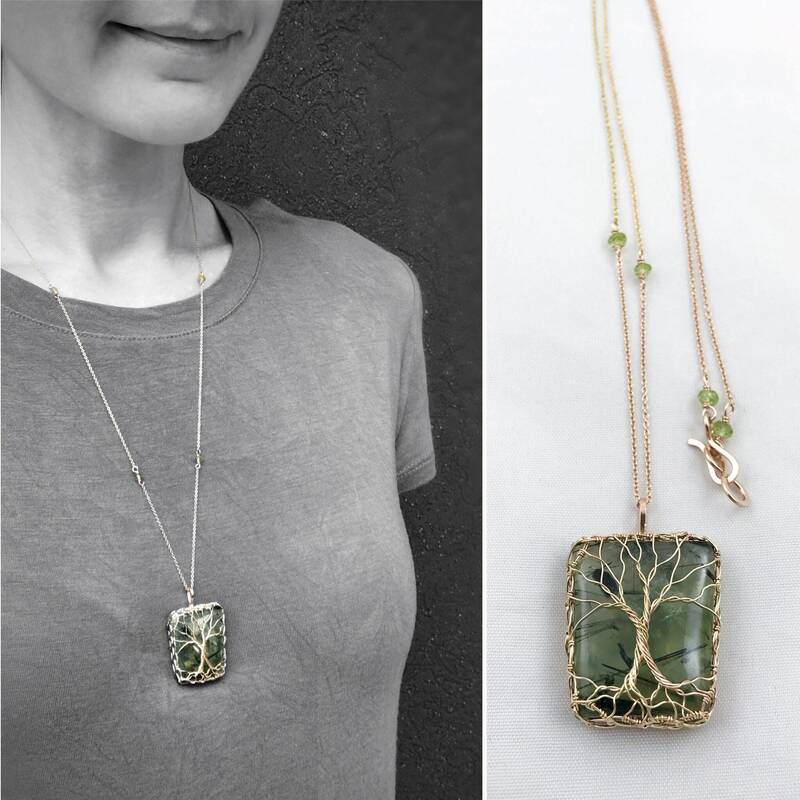 One of a kind 14k yellow gold filled and 14k rose gold filled double tree of life necklace on a stunning rectangle cut green Prehnite stone. 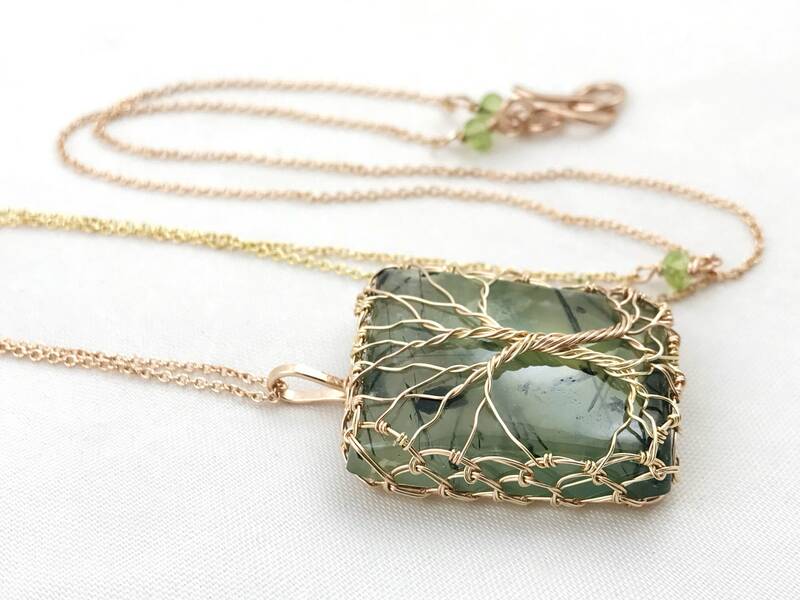 Dangling from a two tone 14k yellow and rose gold filled chain with faceted peridot bead accents. Two trees, strong as individuals, self sustaining and whole in their own right. Made stronger, more full, more dynamic and even more magnificent as they grow together. A beautiful symbol of a relationship that is ever evolving, every day new, always in a state of dynamic growth. 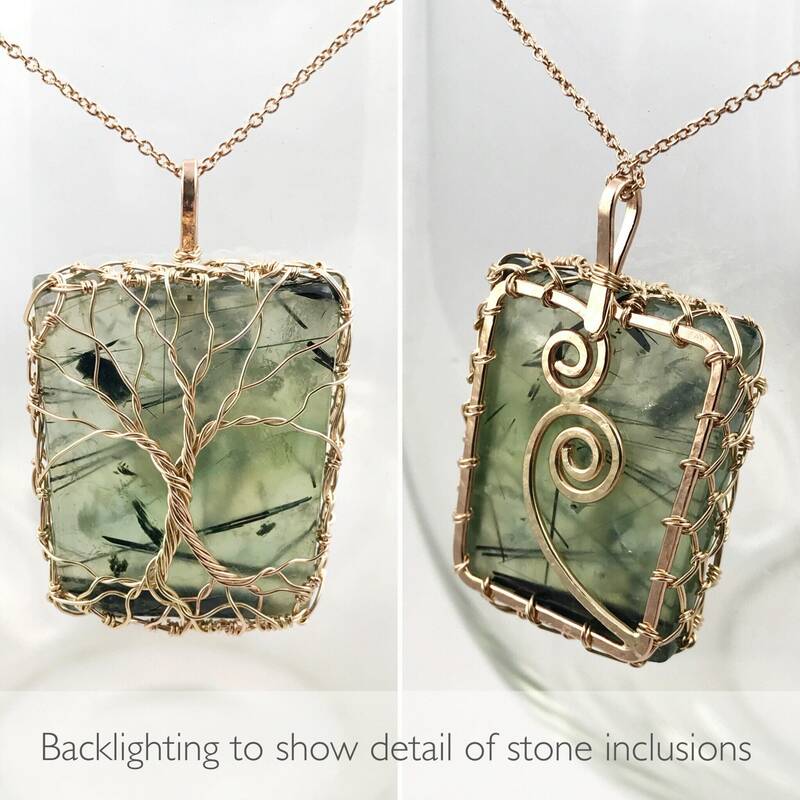 This Prehnite stone is translucent (light can pass through) and is a lovely light spring green in color with dark needle-like inclusions of epidote and black tourmaline. 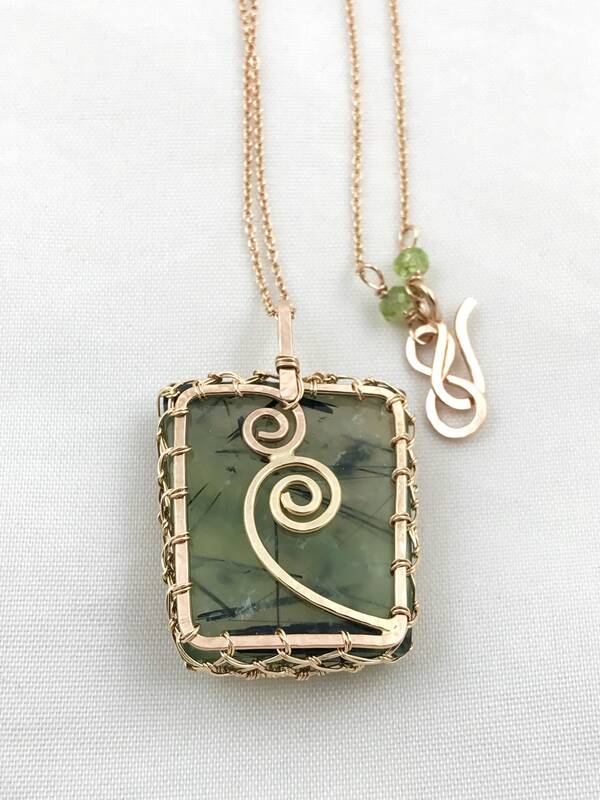 Prehnite stone is set on a hammered 14k rose gold filled rectangle backing with a double spiral detail (one rose gold filled spiral and one yellow gold filled spiral), and mounted in a very secure double woven 14k yellow gold filled/14k rose gold filled bezel which flows into the two-tree design on the front of the stone. 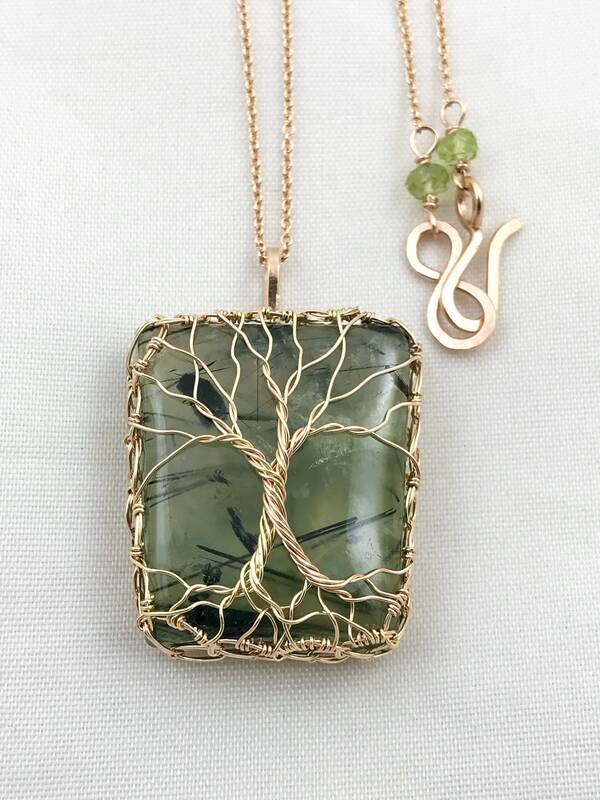 One tree is yellow gold filled, the other is rose gold filled. They intertwine at the center point of their trunks and combine into one magnificent two toned tree at the top of the design. 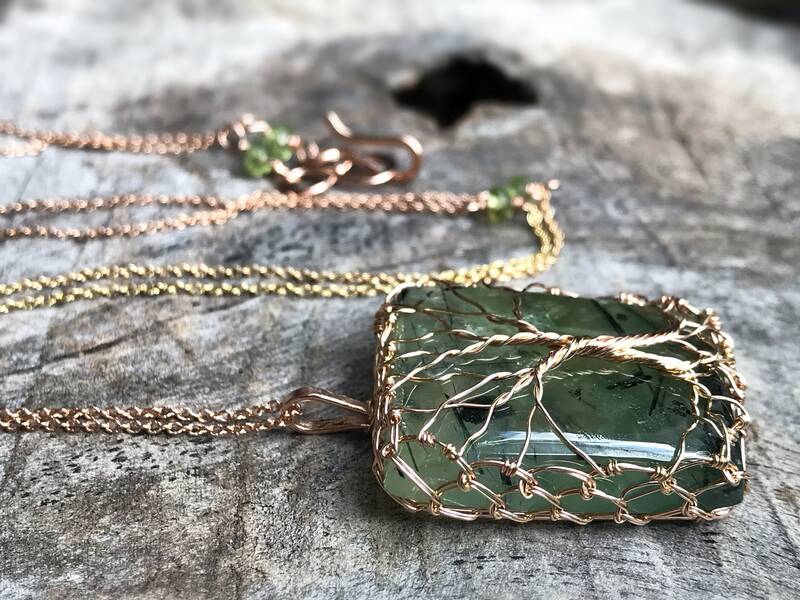 The color difference in the rose gold filled and yellow gold filled wires are subtle, but make for a beautiful gentle color variance against the green stone. -Pendant measures 29mm (1 1/8") tall (not including the top loop which adds about 1/4"), 25mm (1") wide, and 10mm (3/8") deep. 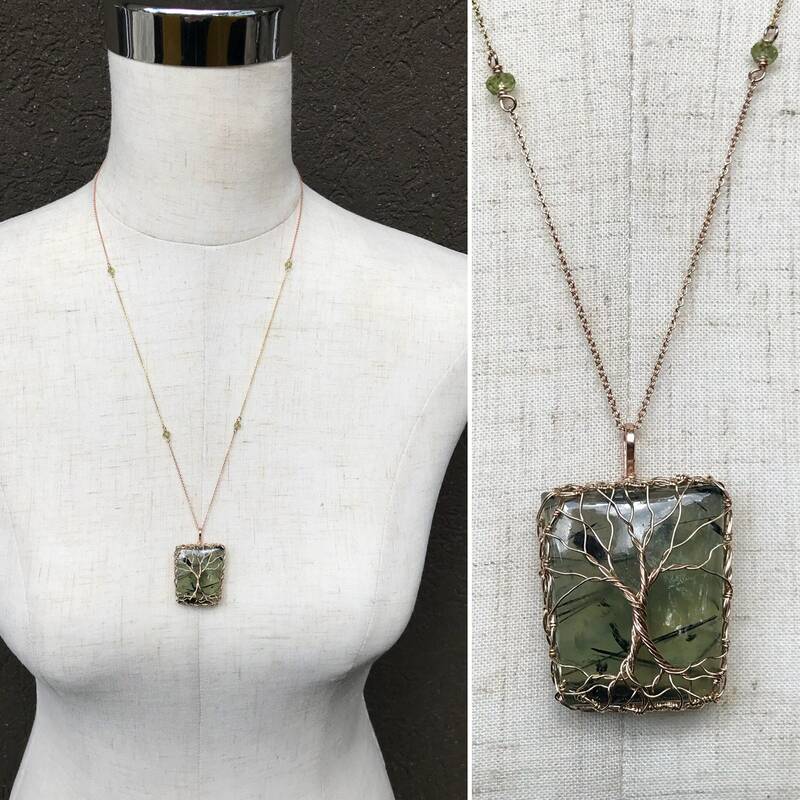 -The stone is a genuine natural rectangle cut green Prehnite stone with a light spring green color and dark needle-like inclusions of epidote and black tourmaline. -Back setting is 14k rose gold filled with two spiral designs: top spiral in 14k rose gold filled, bottom spiral in 14k yellow gold filled. Spirals are soldered together where they meet, in 14k gold solder. -Bezel is a double strand of 14k rose gold filled and 14k yellow gold filled wire, very carefully woven around the stone to hold it securely. 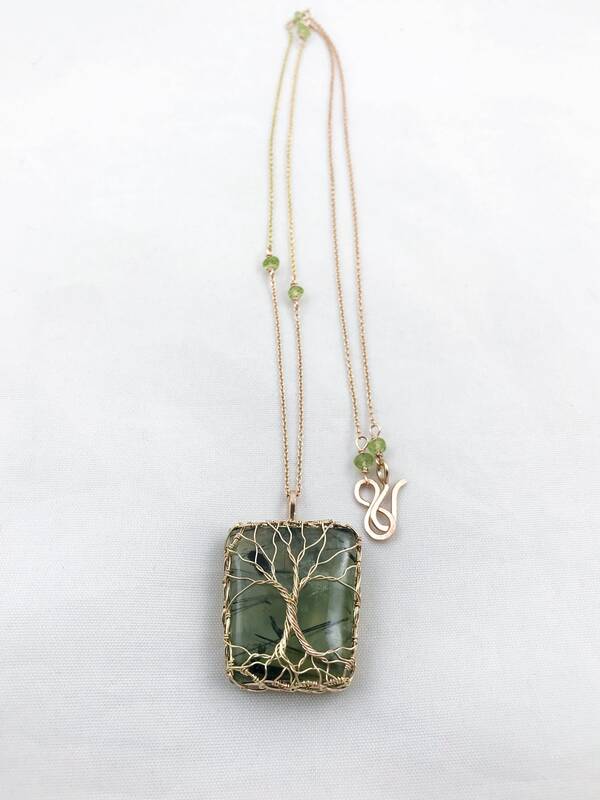 -Double tree design is two tone: One tree is yellow gold filled, the other is rose gold filled. They intertwine at the center point of their trunks and combine into one fully integrated two toned tree at the top of the design. 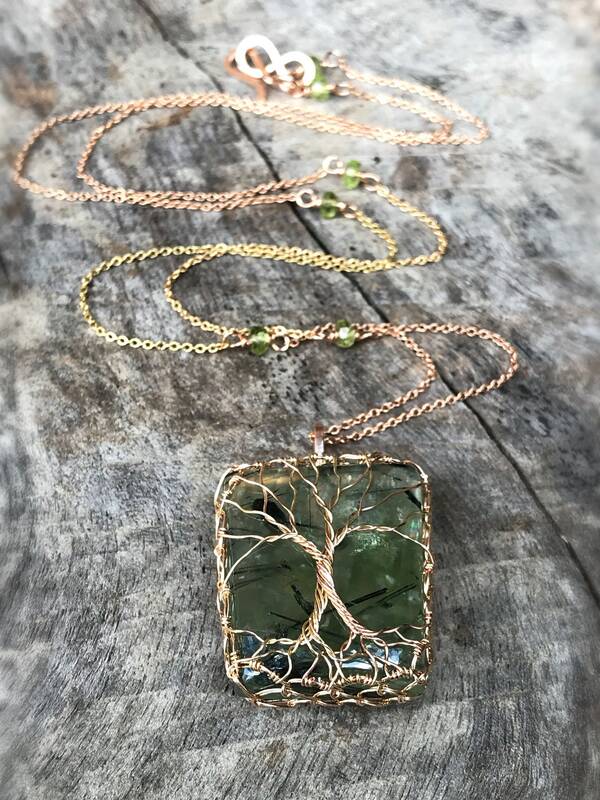 -The color difference in the rose gold filled and yellow gold filled wires are subtle, but make for a beautiful gentle color variance against the green stone. -Chain is a two toned 14k gold filled 1.1mm width 24" length cable chain with a hammered 14k gold filled hook and loop clasp. The majority of the chain is 14k rose gold filled, including the clasp, with a center section of 14k yellow gold filled chain to complement the two toned design. 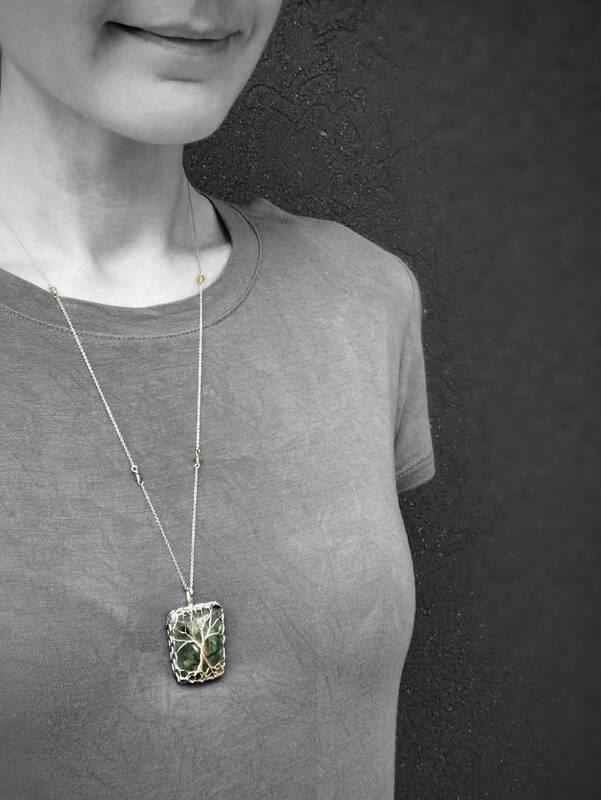 The chain features six 2x4mm faceted peridot stone accent links for added sparkle and color. Prehnite is a translucent green gem-quality hydrated calcium aluminum silicate. A metamorphic mineral, it occurs in the veins and cavities of volcanic rock. It is known as a stone of unconditional love, believed to connect the will and the heart.